Reading Canada goes beyond clichés of wheat and snow. Contemporary Canadian award-winning YA writers share their visions of the country’s past, present and future, and offer critical, theoretical, pedagogical and aesthetic frames for understanding. The Table of Contents outlines the conceptual flow of the book. Writers of contemporary realistic fiction explore young people’s lives across Canada’s cultural mosaic. They create a mirror of modern life: its diversity, its complexity, conflicts and challenges (poverty, abuse, bullying), and its interests and rewards (friendship, romance, achievement, adventure) in home, school, and society. Writers of speculative fiction help us imagine a future world that is utterly different. When we speculate, for good or ill, we imagine possibilities. Science fiction, fantasy and myth envision possibilities for uses of science, for the environment, for social structures, for human rights and human potential. The artistry, sophistication, and conceptual complexity of many picture books and graphic novels give them "crossover" appeal to teens and adults, who use both textual and visual "grammars" to negotiate meaning in the space between image and text. Contemporary YA literature has, like its readers, embraced the digital age; its characters use online jargon and move with ease in electronic settings. This chapter includes resources that support the 21st century learner, and offers insights and strategies for educators. ...a finely crafted exploration of Young Adult Canadian literature. 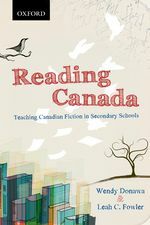 It’s a comprehensive and eloquent argument for teaching Canadian literature in our schools – in fact, for teaching Canadian literature in any school in the world. Thomas Trofimuk, author, Waiting for Columbus. Wendy Donawa, an independent scholar now living in Victoria, was formerly a teacher of literature at the Barbados Community College, and Education Curator at the Barbados Museum. Since settling in BC, she has taught at the Unversity of Victoria, the College of the Rockies, the University of Lethbridge and Royal Roads University. She currently focusses her interests and energy on poetry, most recently Thin Air of the Knowable (Brick Books, 2017). Leah C. Fowler is Professor Emerita from the University of Lethbridge, where she received the University's Distinguished Teaching Award in 2010. Her book A Curriculum of Difficulty: Narrative Research in Education and the Practice of Teaching approaches narrative inquiry through a series of deepening narrative "orbitals".